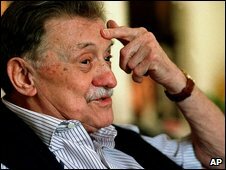 Uruguayan writer Mario Benedetti, whose novels were widely translated and poems set to music, has died at the age of 88 at his home in Montevideo. Benedetti's work chronicled the life of Uruguay's middle-class and was popular throughout the Spanish-speaking world. He lived in exile from 1973 to 1983 during military rule in Uruguay and was well-known as a supporter of the Cuban government. His readings of his work attracted sell-out crowds in Uruguay. "I don't think we should be talking of a loss, because he will be with us forever," Uruguayan Culture Minister Maria Simon told local media. Born to Italian immigrants, Benedetti wrote more than 80 novels, poems, short stories and essays during a career spanning six decades. His 1960 novel The Truce was translated into 19 languages and made into a film. Spanish singer Joan Manuel Serrat set Benedetti's poems to music, including The South Also Exists, an anti-US polemic. A left-wing activist, Benedetti went into exile when the military came to power in Uruguay in 1973. He returned to his homeland 10 years later in what he dubbed his "unexile". Benedetti died at home on Sunday morning. He had suffered from respiratory and intestinal problems and had recently spent some time in hospital.